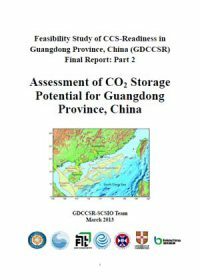 This report, authored by the GDCCSR-SCSIO Team, is the second part of the final reports of The CCS Readiness Study for Guangdong Province (GDCCSR) project. In this report, the effective storage capacity of CO2 in sedimentary basins onshore Guangdong (the Sanshui Basin) and offshore (the Pearl River Mouth Basin, Beibuwan Basin, Qiongdongnan Basin, and Yinggehai Basin) are assessed based on available geological data. It is concluded that the CO2 storage potential is limited inland Guangdong but abundant offshore. The offshore sedimentary basins in northern South China Sea, especially the Pearl River Mouth Basin, have sufficiently large and high-quality storage potential for storing the CO2 from Guangdong province in over one hundred years.